Dreaming on “How to take early retirement ?” or ““How can I get early Retirement?” seems fantastic. Just say goodbye to your work and pursue your passion, hobbies, engage in charity activities, travel or just sit and enjoy life. To retire at the prime of life and have freedom to do whatever you wish to do is seductive. There will be no more daily grind of rushing to office, meeting deadlines, office politics, and such stuff. But before you call it a day at work, think it over and again and make a decision on ‘at what age can I retire?’. Retiring early may ensue in lots of trouble if not planned properly for financial independence. To illustrate the risks of early retirement, ‘The Lotus Eater’ a short story by Somerset Maugham will come handy. The story has a Wilson who chucks his job of bank manager and goes to live in beautiful island of Capri to breathe serenity. In the following years his savings gets dried and he is reduced to live as farmhand in his landowner’s house and finally dies deranged. A man who pursued his passion met with a tragic end. Retiring early has its share of risk. So you must do a risk-analysis of early retirement before you take the plunge. 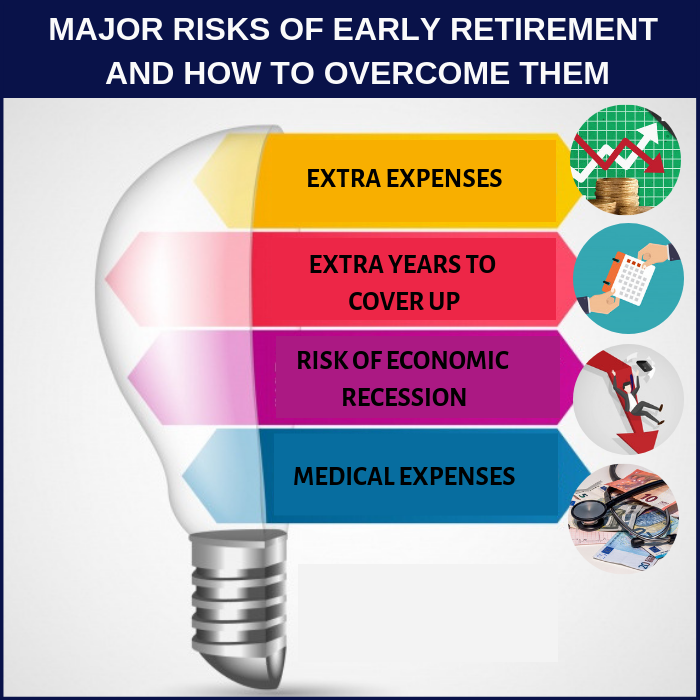 The following are the 5 major risk areas that can spoil the enjoyment in your early retirement if not planned properly. If you want to maintain the current lifestyle post-retirement, as a rule of thumb you need to spend 80% of what your current expenditure is. But if you want to travel, learn shooting or fix up some vintage car as a retiree, your saving of 20% by not working will be expended. As you are retiring early, you can’t sit idle like a regular retiree. You may like to explore something. This will increase your expenses. Another factor of consideration is your timing of retiring early. The earlier you retire the more money you need to cover up your non-working years. This also includes medical expenses and nursing care. Now you have arrived at the amount for your post-retirement life after considering all aforementioned factors, is it enough to stand you in good stead in worst-case scenarios. If the overall economy is performing below the par, your average returns will take a dip and you’ll be forced to bite into your investment capital and over the years your assets could shrink. The inflation can shoot up your living expenses and your retirement life would be in trouble. The compounding effect of inflation can easily & out your retirement corpus if you have not considered and accounted them properly in your retirement plan. Of course, you could have taken a separate mediclaim policy . However, there may be some ongoing regular medical expenses which are not covered under your mediclaim policy. You need to factor in those expenses as well in your retirement corpus. At times your poor health may destroy your wealth and make you poor. If you are contemplating on “How to take early retirement?” or ““How can I get early Retirement?”, you must ask yourself why. Is it because you dislike your current career and want to end the pain? The best you could do is to find a more fulfilling job and enjoy more of your time and money now, rather than saving it for uncertain future. Retiring early with financial independence, but without a strong motivation may put you in a state of non-activity and meaningless life. Maybe you have a dream to dedicate yourself to some creative pursuit like writing a book, to teach underprivileged children, or maybe you just want to travel. A powerful motivation is compulsory not only to make your early-retirement life enjoyable but to make it easier for you to stick to a strict financial plan. If you retire early, you have got more time to fill in some meaningful way and also more non working time to pay. Say you have 20 -30 years to enjoy retirement, you must have some activity to pursue that satisfies you and enough money to sustain you though all these years. So you need a strong reason to quit your job and must find ways to stretch your savings and time. Otherwise, you will face the risk of sitting idly and feeling frustrated for not doing anything. Are you retiring early with Financial Independence? It is not just retiring early; but retiring early with financial independence. This is the most fundamental part of early retirement. When you plan for early retirement, you need to assess your current net worth. Net worth is calculated by adding up all your assets – stocks, retirement corpus, and cash – and deducting all your outstanding debts – credit card debts, loans, and mortgage. Once you know how much money you have, you have to figure how much money you will require when you retire. There are many factors that determine the corpus for retiring early with financial independence: what my lifestyle would be after I retire, at what age I can retire and what I want to do after retirement. How many years you have for your post-retirement life? How much money you need to live your post-retirement comfortable? What activities you want to pursue for a fulfilling life? In the initial years of early retirement, you will be very enthusiastic about doing things, exploring new places, or pursuing hobbies. After the honeymoon period is over, boredom and emptiness may creep in. So you need to always find ways to keep you upbeat and energetic. As well you need to have enough funds to make your life comfortable. You can’t be sure about future. You may live longer than you expected and unexpected health issues can crop up. To avoid the risk of doing nothing and being penniless, you must have a long term plan for your post-retirement life. Having a sound retirement plan and long term plan are the best ways to retire early. There are many financial issues that will jeopardize your early-retired life. And finally you must factor into failure too. What will you do if you retire early and can’t manage your life. You must have a back-up plan to get back to the work world. Early retirement has its own boons and pitfalls. After calculating all the risks involved, if you still have the strong urge to retire early, go ahead and plan properly in advance for financial independence. Life is about happiness and happiness is about the journey- not the destination.